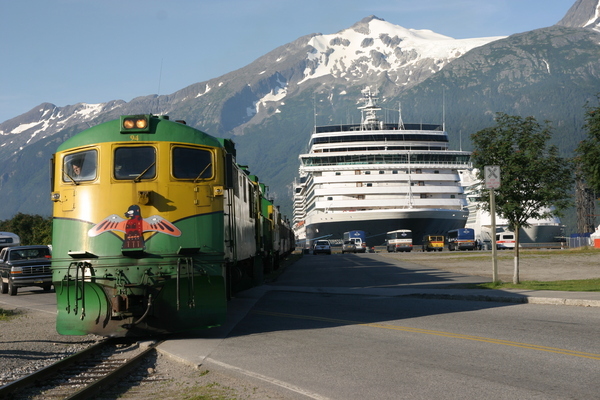 The White Pass & Yukon Route Railroad, a narrow gauge rail line, offers several different scenic train excursions from Skagway along the first 67.5 miles of the original 110-mile route that once connected Skagway with Whitehorse. The journey traces the historic “Trail of ’98” which lead thousands of gold-seekers from the staging grounds at Skagway to the gold fields of the Klondike in Canada’s Yukon Territory. 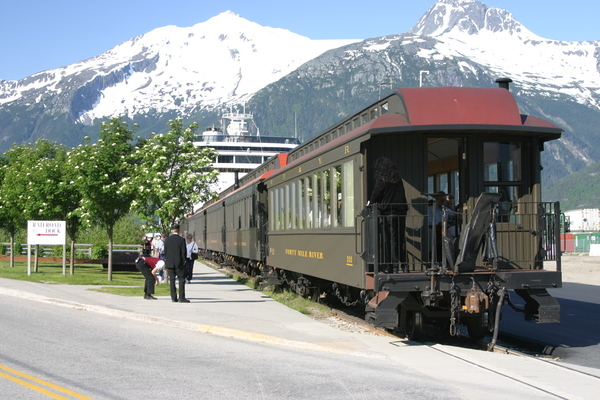 Today the railway provides passenger service in comfortable restored and replica coaches pulled by vintage diesel locomotives through the coastal mountains between Skagway and Carcross, YT, along Lake Bennett in British Columbia. Construction of the WP&YR began in 1898 during the height of the Klondike Gold Rush and was completed only 26 months later in July 1900. At the time, construction was considered to be one of the greatest feats of modern history. The $10 million project involved 450 tons of explosives and tens of thousands of men laboring in harsh and challenging conditions to construct “the railway built of gold.” In l994 the railway was designated an International Historic Civil Engineering Landmark, a designation shared with the Panama Canal, Eiffel Tower and Statue of Liberty. One of the Railroad's most popular excursions is a three-hour, forty-mile round trip from sea level up over the 2865 foot summit of White Pass, considered one of the world’s most spectacular train rides, with steep grades and cliff-hanging turns. 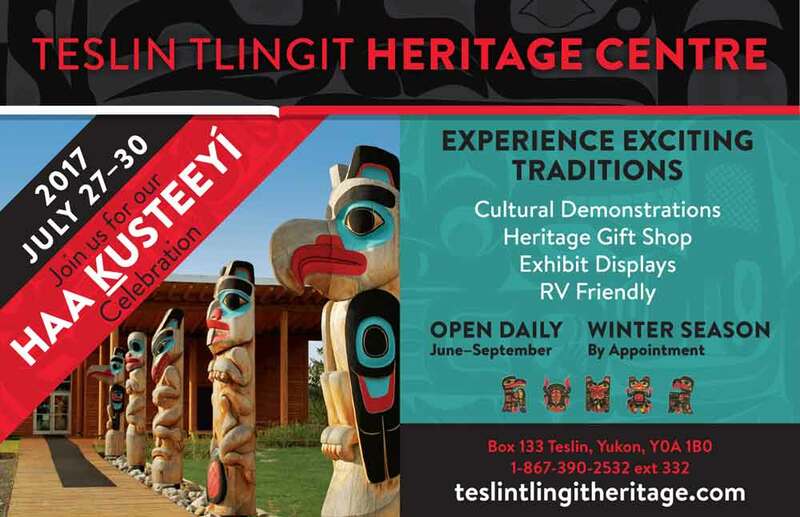 The fully narrated tour features two tunnels, sky-high trestles and bridges, historic sites and spectacular scenery affording panoramic views of glaciers, gorges and cascading waterfalls. The steel cantilever bridge was the tallest of its kind in the world when it was constructed in 1901. 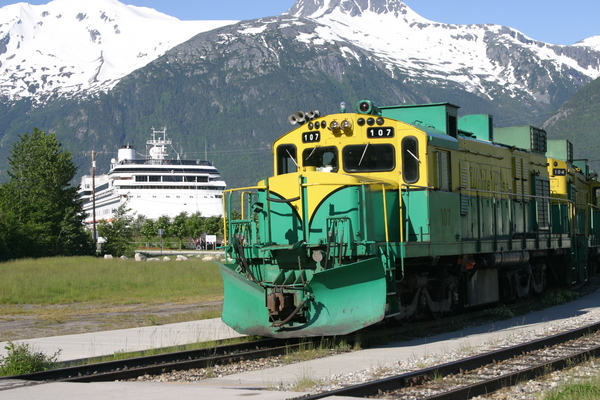 White Pass & Yukon Route evolved into a fully integrated transportation company operating docks, trains, stage coaches, sleighs, buses, paddle wheelers, trucks, ships, airplanes, hotels and pipelines, ultimately pioneering the innovative inter-modal (ship-train-truck) movement of containers. The company suspended operations in 1982 when Yukon’s mining industry collapsed due to low mineral prices. The railway was reopened in 1988 as a seasonal tourism operation and today carries over 400,000 passengers during the May to September tourism season. Come discover your own personal gold rush with the White Pass & Yukon Route Railway as it steams through its second century of history. 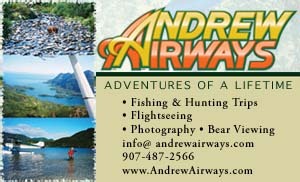 For information, visit their website at www.wpyr.com; phone: 1-800-343-7373; fax: (907) 983-2734; PO Box 435 Skagway, AK 99840-0435; 231 Second Avenue; email: info@whitepass.net. Summit Excursion trains are wheelchair accessible. Reservations are highly recommended.